Getting ready to plan for fun times this summer? Deep Creek Lake, Maryland will fit your every summer fun need. 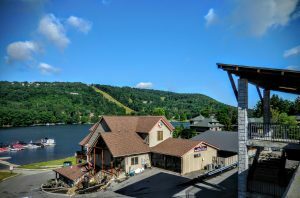 Whether you like sunny days, water play, music, movies, casual dining or fancy foods you can find it all at Deep Creek Lake. Water play is the name of the game at Deep Creek Lake. Such a variety of boating options offers something for just about every day of the week. Boating, bumper boats, canoeing, kayaking and whitewater rafting are just some of the options. There is also a large aquatic recreation complex which includes two indoor pools. One is lap pool as well as an open swimming pool. The other is a warm pool for relaxation. Who knew that dog-sledding could be an all year event? That is correct. You can enjoy meeting the dogsled team and watching them take off for their run. Learn more about dog-sledding and make this a learning experience for the family. Do you love to fish? 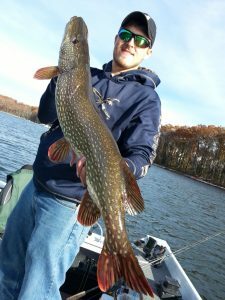 You can bring your gear or take a Deep Creek Lake fishing tour. Take a few hours out of a day and enjoy the fresh air and beautiful lake. Try your hand at catching one or more of the many fish ready to take your bait. Striped bass, perch and walleye are very popular catches as well as a multitude of other fish. Just be sure you have a fishing license. Short term licenses are available. How about geocaching? There are at least ten caches at Deep Creek Lake. Some are more challenging than others. Rock climbing with rappelling is another exciting feature to enjoy. 550 acres are available for rock climbing, geocaching, rappelling and more. Have a mountain bike? Bring it along so you can take on this adventurous play with natures own. Ready for some golf? The Deep Creek Lake areas enjoys four different courses with varying degrees of difficulty – some even overlooking the beautiful lake! Segway tours for taking the rubber to the trails are fantastic. Prefer go carts? Visit Smiley’s family fun center. There are kiddie carts, road track and slick track options. Finish out the day with some laser tag or a lighter fare chairlift ride. No matter what taste of fun you have there is something for you for summer fun at Deep Creek Lake, Maryland.